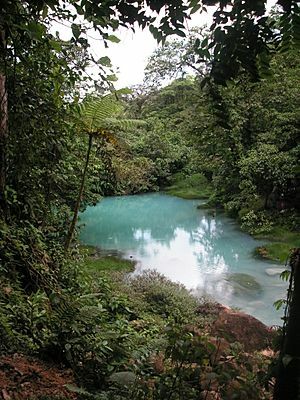 The Rio Celeste (sky blue river) at Tenorio Volcano National Park in Costa Rica. This is a list of rivers in Costa Rica. The list is arranged by where the river drains. Tributaries are indented under each larger stream's name. List of rivers of Costa Rica Facts for Kids. Kiddle Encyclopedia.